Built between 1881 and 1893, cutting across the Isthmus of Corinth, the Corinth Canal is still just as helpful a navigational aid today for a crewed yacht charter as for general shipping when built, and is still a busy commercial shipping canal. 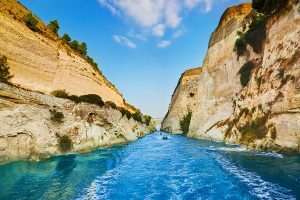 Cruising through the Corinth Canal while on a crewed yacht charter in Greece, is not only a experience within itself, but also a cruising shortcut to access the Ionian Islands from Athens for a crewed yacht charter cruise of the Greek Ionian Islands. 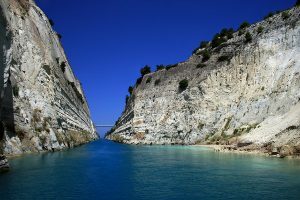 The Corinth Canal effectively connects the Aegean Sea with the Adriatic Sea, and separates the Peloponnesian Peninsula from the mainland of Greece. Built all at sea level so as to avoid locks, the waterway is a deep cut into the landscape and was a great technological and engineering feat when built. 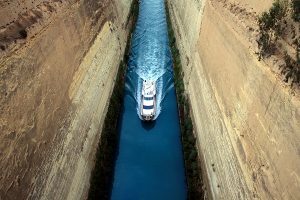 At 6343 kilometers in length, 8 meters deep with sheer walls rising up 63 meters from the water level of the canal to the land surface cruising through is a Bucket List experience. 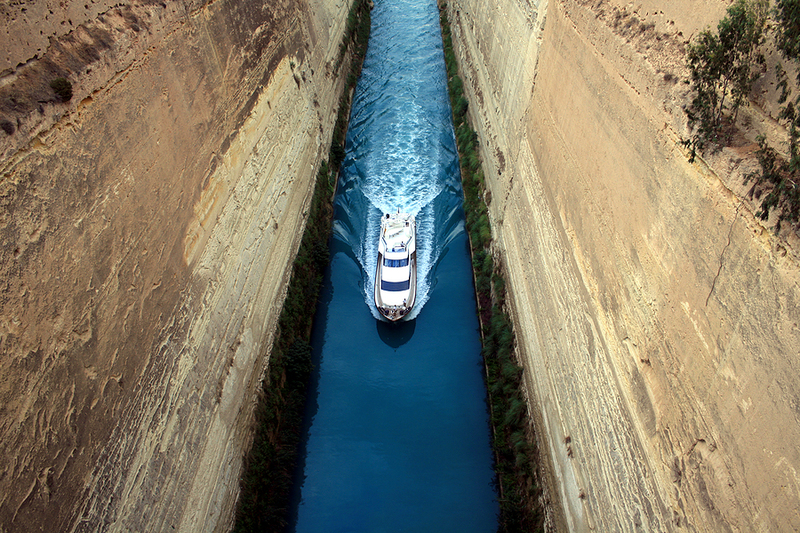 When built, the canal was at a width necessary for ship travel in the late 1890’s, however today is too narrow for some modern ships to enter. Traffic through the canal must be monitored for one way cruising only, and there is a cost to use the canal for each crossing. Most crewed yachts available for charter are still in a size range to be able to cruise through, except for the largest of charter motor yachts. Cruising through the Corinth Canal reduces the cruising distance needed by at least 185 nautical miles as it is no longer required to round the southern end of the Peloponnesian Peninsula to access the lovely Ionian Islands for a private yacht charter.